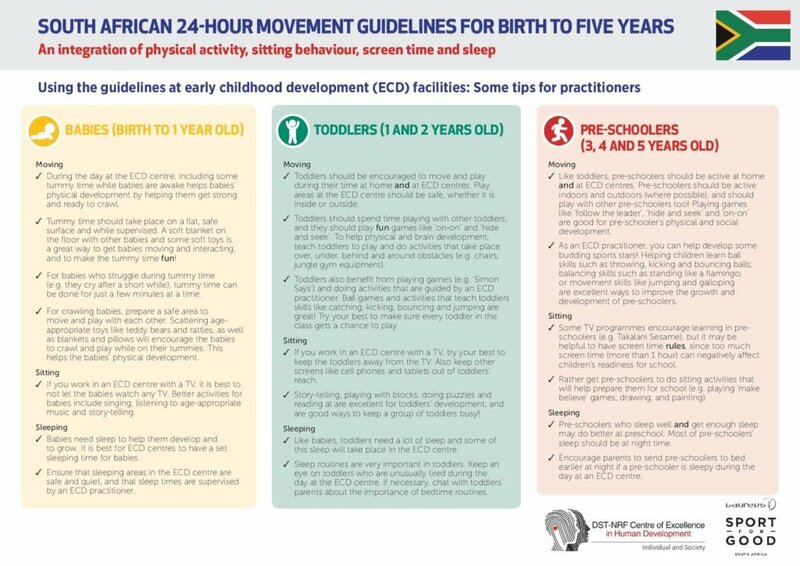 Cape Town, 4 December: “We have the opportunity in the early years to set children on the best path for the growth, health and development by laying down the right foundation in terms of their activity, screen time and sleep” says Dr Catherine Draper – a senior researcher at Wits University, and leader of the initiative to develop South African 24-hour Movement Guidelines for Birth to Five Years, which has been supported by the Laureus Sport for Good Foundation South Africa. These guidelines were launched at the Nelson Mandela Children’s Fund in Johannesburg this morning. Attending the launch were representatives from national government and the NGO sector, practitioners, academics, partners of the Laureus Sport for Good Foundation South Africa and the Nelson Mandela Children’s Fund, and the media. Representatives from the DST-NRF Centre of Excellence in Human Development, a partner for the dissemination of these guidelines, were also in attendance. And since a launch about children would not be complete without children, there were also some children and teachers from an early childhood development centre in Soweto attending as well. 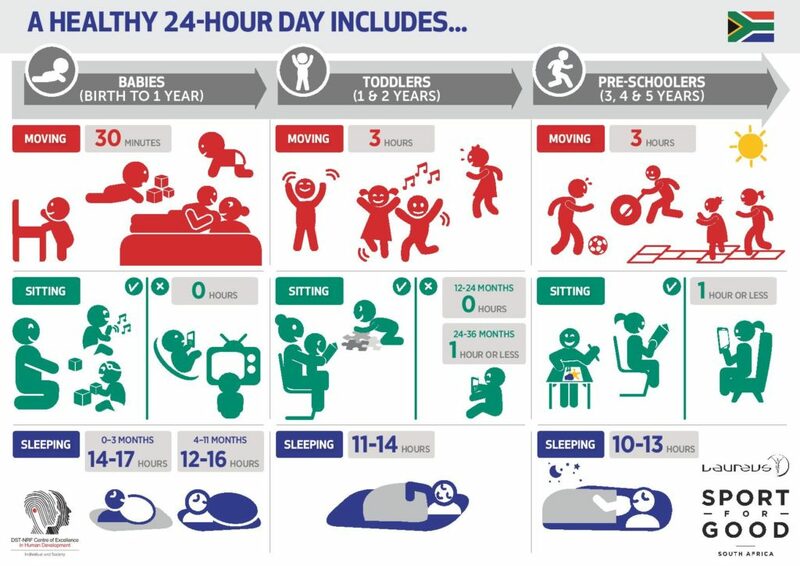 Movement behaviours include physical activity, sitting, screen time and sleep. The benefits of young children being physically active, not sitting too much, not spending too much time on screens, and getting enough sleep are well documented in research. These benefits include better motor skills, being more prepared for school, regulating emotions better and enjoying a greater quality of life. “Movement is critical for young children to communicate, grow, learn and explore. It provides children with the opportunity to share experiences, reflect on these experiences and to explore the world and new ideas. Understanding of the world grows as children’s communication becomes more developed and complex and movement is the ideal avenue to make this a reality.” Marie-Louise Samuels, Director: Early Childhood Development, Department of Basic Education. 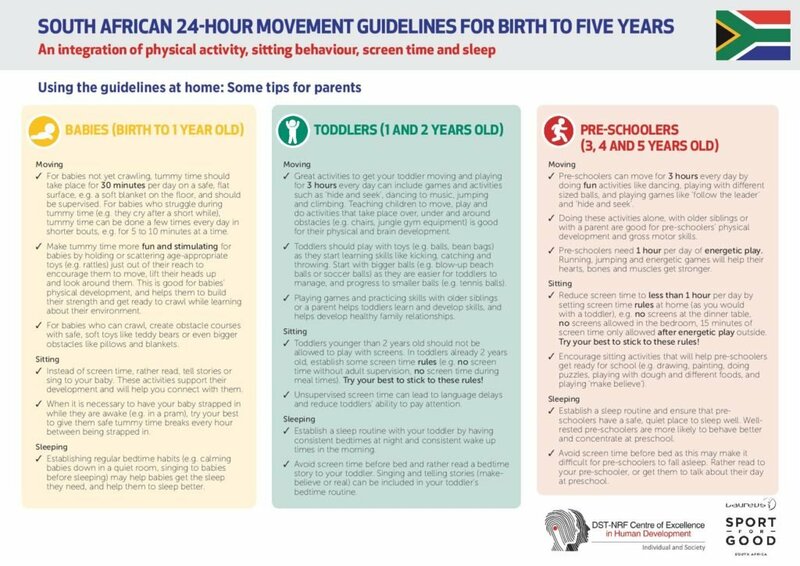 South Africa is the first low- and middle-income country to bring out movement behaviour guidelines for this age group (and the first of these types of guidelines for South Africa), following the example of other countries who have recently updated or are busy updating their movement behaviour guidelines for the early years – Canada, Australia, and the UK. 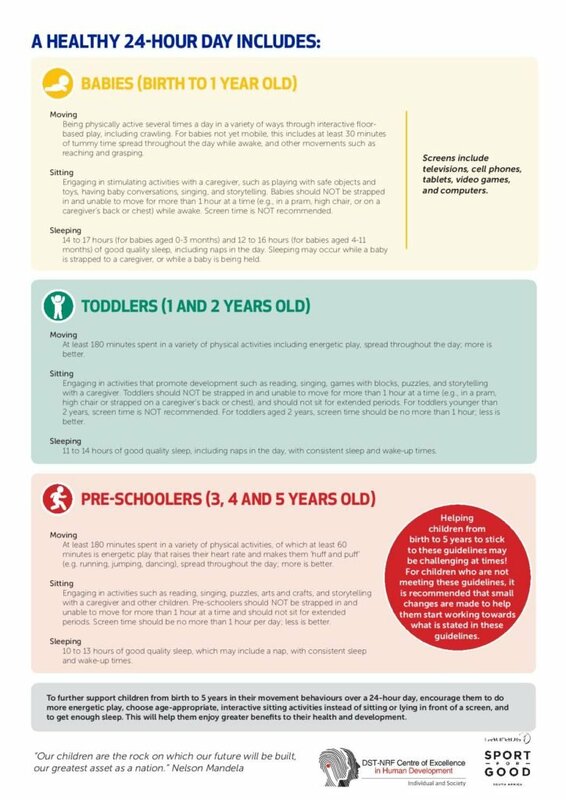 The new South African guidelines recommend that 0-5 year old children should engage in a variety of age-appropriate activities that are playful and fun, and that support social interaction and nurturing interactions with caregivers. In this age group, what children do when they are sitting is crucial. The less screen time they have, the better. Activities that involve talking, reading, creativity and fine motor skills are much better for the cognitive, physical, social and emotional development. A preamble to these guidelines, along with the specific guidelines and an infographic are provided below. “Funding The Early Years Movement Guidelines was important for Laureus, as it provides a best-practice guideline for coaches and educators in the Sport For Development Sector aiming to improve physical and cognitive development in young children. Laureus believes all young children should be encouraged to live a healthy lifestyle by participating in fun, non-competitive physical activity, and active play. Developing these skills at a young age helps a child gain confidence and the ability to do more complex skills in future activities such as sport.” Mornè Du Plessis, Chairman – Laureus Sport for Good Foundation South Africa. I can feel their lives basically responding enough, because they are always happy with what they do.